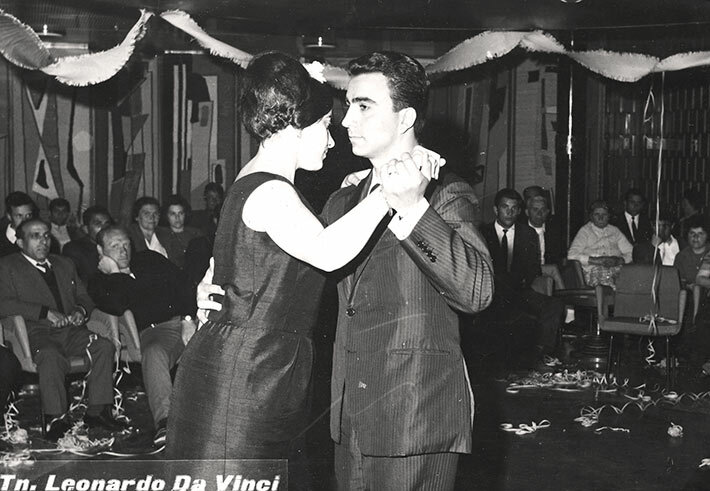 Black and white photograph showing Antonia Anatasio dancing with an unidentified man aboard the Leonardo Da Vinci during the ship's voyage to Halifax, NS in 1966. Antonia and the unidentified man can be seen in the foreground wearing formal wear. Antonia's hair is worn in an updo known as the beehive which was popular throughout the 1960s. In the background a number men and women are seated around the dance floor observing the dancers. There is a large ribbon hung from the ceiling and thin streamers can be seem on the floor.